This year’s Richard Tucker Gala was a refreshingly well-balanced program of less frequently heard arias interspersed with operatic chestnuts one expects to encounter at a gala. No major singers cancelled (although two pieces were dropped from the program including one which should have been one of the evening’s highlights), and almost everyone brought her or his A-game. This review should practically write itself, no? But it didn’t, and I blame technology! I was restless after a lengthy traffic-snarled commute home, so rather than sit down to start my review I decided (wisely, or not) to re-watch the concert courtesy of Medici TV. That decision resulted in a near sleepless night as I tried to reconcile the disparity of what I had experienced in-house versus the broadcast concert I watched on my computer. This disparity was most evident in Christine Goerke’s offerings. In Ariadne’s “Es gibt ein Reich” the voice sounded constricted and unsteady. Notes within a single phrase came out at incongruent dynamic levels that seemed less interpretive choices than the result of an unwieldy voice. As Strauss’s musical lines ascended, the soprano’s voice became thinner, curdled and nearly inaudible. But in the transmission, these “faults” seemed much less pronounced; the tone steadier, the dynamic contradictions less evident and deliberate. And if Strauss’s vocal climaxes didn’t exactly soar, they also didn’t completely disappear into the orchestral fabric the way they did in the Hall. On the opposite end of the spectrum was Yusif Eyvazov. The artist may not be blessed with an especially beautiful instrument, but he uses it intelligently, and in an era deprived of spinto-tenors, he helps fill a void. Watching at home, all of the tenor’s shortcomings were evident. His “Ah! Sì, ben mio” and Di quella pira” seemed small-scaled; the tone tinny, the fast vibrato and pitch suspect. Yet in-house the aria sounded beautifully shaped and meltingly sung. The cabaletta—in key, with both verses (thank you very much) and three High Cs—while somewhat blunt, was nevertheless thrilling and anything but small-scaled. Falling somewhere in-between were this year’s award winner Christian Van Horn and soprano Nadine Sierra. 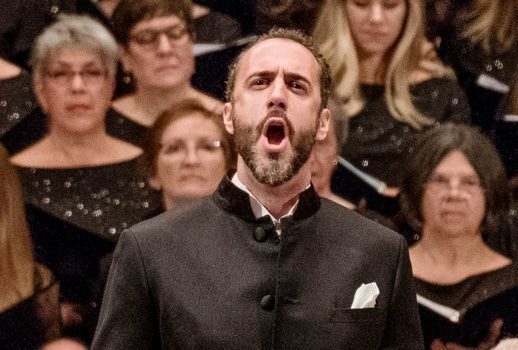 Van Horn’s performances of Zaccaria’s “Oh, chi piange?” from Verdi’s Nabucco and “Ella giammai m’amo!” from the same composer’s Don Carlo seemed to signal that this artist is ready, vocally at least, to take on the bigger bass-baritone roles. Philip’s monologue in particular was gorgeously sung with an impressive display of breath control. But from my seat in the rear of the orchestra it had zero dramatic impact. Imagine my surprise when my computer screen revealed an artist fully invested in the words and drama. I must confess that Nadine Sierra’s allure has thus far eluded me. I recognize that it is a lovely voice, evenly and soundly produced, but I find the overall quality somewhat generic and lacking any impact in the theater. Unfortunately her performance of “Me llaman la primarosa” from Gimenez’s El Barbero de Sevilla, well sung as it was, did little to change my impression. That is until I watched it online. What had come across as dull and faceless in the Hall radiated life and personality on the screen. What was small-scaled took on greater dimension. However, certain performers and performances transcended the medium and sparkled in person and on the broadcast. Angela Meade can be a frustrating singer, but when the soprano delivers, she delivers big. Just as she did in the 2013 Richard Tucker Gala singing “Tu al cui sguardo onnipresente” from Verdi’s I Due Foscari, Meade stopped the show with another early Verdi aria and cabaletta. This time it was from the composer’s I Lombardi. Her “Oh madre, dal cielo” featured gorgeously spun pianissimi, and the cabaletta “No, no! giusta causa” found the soprano fearlessly hurling out the difficult vocal lines and capping the scena with a blazing high D natural. Whether relaying the story of his apartment recently being burglarized in Barcelona or pinging out high C#s, Javier Camarena exudes an openness and effortless charm that is simply infectious. The decision to omit his second scheduled piece: Zingarelli’s “La dai regni dell’ombre, e di more” from Giuletta e Romeo was one of the few disappointments of the evening. I would have preferred it to the Armida duet with Meade, which was fine enough, but found neither the tenor nor the soprano at their most compelling. 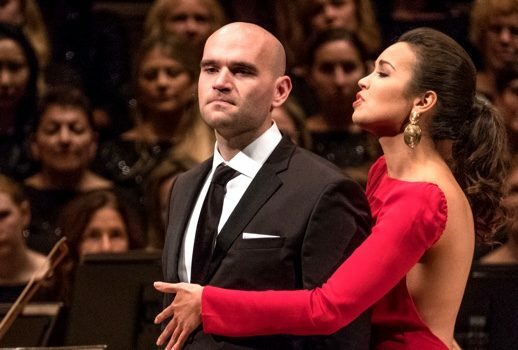 If Camarena is all effortless charm, tenor Michael Fabiano is walking angst. Few singers embrace heartbreak, despair and rage with the ferocity that the American tenor does. There are times one wishes he would tone it down just a bit (per favore?). Yet Fabiano delivers the kind of vocal performance that harkens back to the days when opera as blood-sport was the norm. 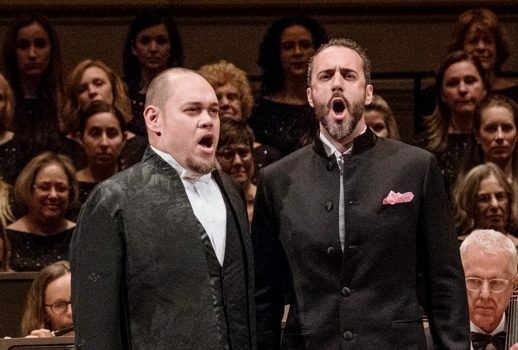 The explosive rage of the recitative to “Quando le sere al placido” threatened the very foundations of Carnegie Hall. The aria proper found the tenor attempting to modulate his dynamics with various degrees of success, but this is a singer who thrives at full throttle. That same approach made the Manon duet with Sierra seem more assault than seduction—with Sierra fully embracing the tenor’s take-no-prisoner style—but there is no denying the duet was as exciting as hell! What to say about Stephanie Blythe? There is that voice! Huge, cavernous, with low notes this year’s award winner would be happy to possess. It overwhelms with individuality and character. If the mezzo’s Carmen seemed more the creation of Madame de la Haltièreme and Baba the Turk than Georges Bizet and Prosper Mérimée, she somehow made it all work without it falling into cheap camp. Which at last brings us to the headliner of the evening. Shorn of her scheduled “Pace, pace mio Dio” (What happened?) Anna Netrebko’s contribution— if more amuse-bouche than full course—was nonetheless the surefire, crowd-pleasing duet “Vicino a te” from Giordano’s Andrea Chénier. Netrebko can never be accused of lacking charisma, uniqueness, nerve or talent. And while I know that I will hear grief for saying this, I found the duet something of a letdown. Perhaps Marco Armiliato’s conducting (How do you make the postlude to this duet sound so perfunctory?) contributed, but the duet remained curiously earthbound. That’s not to say that there weren’t thrills to be found in her full-throated high singing (although sharping was an issue for much of the duet), but the duet just seemed a parade of loud, exciting high notes with little content. Those Parterrians of a certain age may remember a 1970’s television commercial which asked the question “Is it live, or is it Memorex?” In the commercial Ella Fitzgerald sings a note that shatters a wine glass while being recorded on a Memorex tape. When the tape is played back, the recorded note delivers the same outcome. The premise of the ad: the fidelity of the recording duplicates the power of the original live performance. I’m not implying that the live streaming of concerts and operas is solely attempting a faithfulness to its source. But there is, at least on some level, an expectation that what the viewer at home is experiencing closely resembles the live event taking place. Sunday’s concert, for me, proved otherwise. Isn’t it nice to know a lot? And a little bit not.